I haven't written about my experience with running the marathon last weekend except to mention that weather impacted my ability to finish. Specifically, race officials decided to re-route full marathoners to the half marathon course well before the initial cut-off (due to traffic issues, to be allowed on the full marathon course, runners have to pass the 11-mile mark prior to 10:30). We were scheduled to pass this point well before the cut-off, but just a few minutes before we passed the check-point, I overheard 3 Team-in-Training members (Leukemia/Lymphoma Society runners) mention the marathon route had already been closed. I sped up a little at that point and ran to the official at the 11-mile marker. Indeed, the route was closed, no ifs ands or buts. The decision to close the race was due entirely to forecasted weather in the downtown Nashville area. As a family, we were well aware of the weather, because my aunt had been sharing the forecast with us for several days prior to our arrival. We waited up Friday night to catch the weather on the news, and my uncle awoke early Saturday to find the latest, as well. In retrospect, race officials even sent an email the day before the event informing racers that the route may be closed at the 11 mi-marker for those pacing slower than a 10:20 mile, we just weren't home to receive the email since we traveled to Nashville on Friday. My father-in-law told me yesterday that people all over Facebook are lambasting the Country Music Marathon officials for their decision. That makes me angry. Last year a Marine died after running the half marathon in Nashville - temps at race end were topping 90 degrees. Another runner died in the Chicago Marathon in '07. So the weather never became as dicey as predicted in downtown Nashville. Who cares? Wouldn't you rather arrive alive than second guess mother nature and keep running? Race officials did everything they could to keep us safe. The Rock 'n Roll series added 50 spaces to two sold out events - in Seattle and San Diego (too far for me) to accomodate runners from last week. They've reduced the price of next year's event for us by $50 (a substantial reduction). To complain is assinine. As for me, I will finish my full marathon distance. At least, that remains my goal. All the events close to home for me in the next several weeks are already full. So this weekend, I plan to run the race on my own, here in St. Louis. And in the meantime, I pray for Nashville. 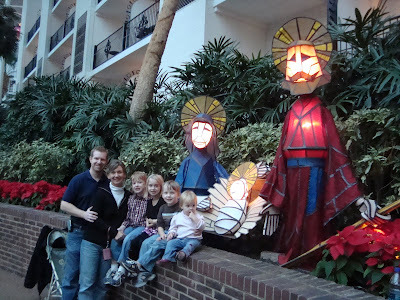 My aunt sent an email that the beautiful Opry Land Hotel, right where this picture was taken two Christmases ago is under 4-5 FEET of water. The Wyndham Resort, behind the hotel is being evacuated due to chest-high waters. The city and people of Nashville need our prayers. No angst over last week's run from this humble St. Louis girl.